I didn't agree with John McCain on much, particularly on domestic policy, and I didn't vote for him for President in 2008, but I respected his integrity and his devotion to country. Senator McCain, who died of brain cancer the other day, was a true American patriot and a genuine hero, enduring torture as a prisoner of war in North Vietnam, serving with distinction in the House and then the Senate, and always fighting to make this country better, whether is was pushing campaign finance reform with Democratic Senator Russ Feingold of Wisconsin or championing immigration reform with Ted Kennedy (who died nine years to the day before McCain of the same cancer nine days to the day earlier), or working on health care. he disliked the Affordable Care Act, but he disliked even more the corrupt procedure being used to repeal it, and he literally gave the thumbs down to the whole process and stopped a bad bill - his last great act. As my grandmother would say (and she actually said it about Gerald Ford), now look at the President we've got! A crooked real estate developer one step ahead of the law has the power to start a war, which makes me wish McCain were still alive and President right now. McCain forgot more about war than Trump will ever know. Farewell to a great man and a true maverick. 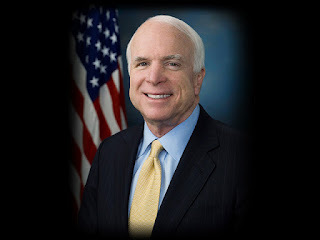 I know, I know, he gave us Sarah Palin, but I come here to praise John McCain, not bury him. I do not come here to praise Trump.